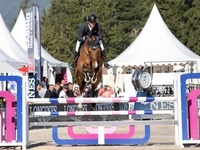 Derin had another good weekend of competition at the CSI5* event in Ascona, Switzerland. Harry K was placed 6th in Saturday's big class, the 1.50/1.55m Premio AXIM SA Project Management Lugano counting for the world ranking as well as ending 14th in Sunday's 1.60m Longines Grand Prix presented by LGT Private Banking. Je Suis van de Bien jumped very good in his five-star debut, while also the 6-year-old Hunter did a great job in his two 1.30m classes. The next stop for Derin and his horses will be the two-star show at Peelbergen Equestrian Center.